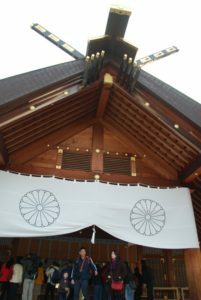 “The omikuji will go on to break down your fortune in health, love, marriage, business, childbirth, disputes, studies, travel, finding lost articles and achieving your desires. These will generally follow the theme of the fortune categories above. My fortune: DAI KICHI = Extreme Luck. 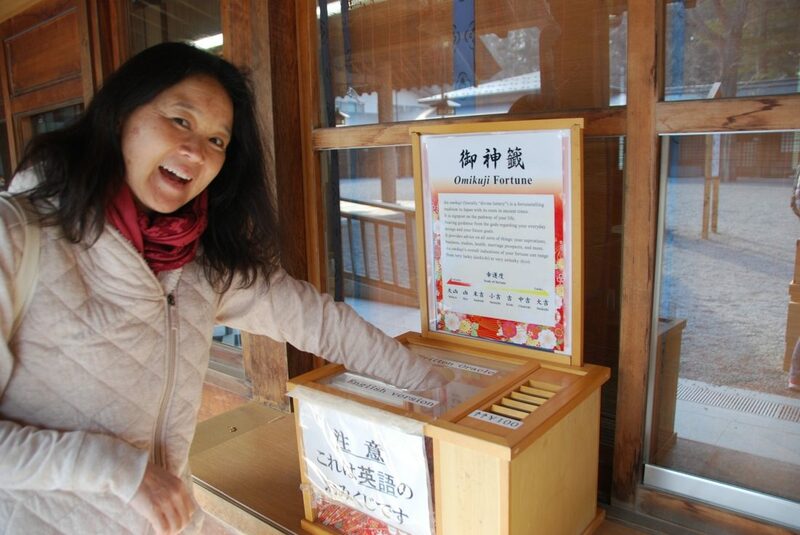 Mayumi’s fortune: DAI KICHI = Extreme Luck. She was so excited by her fortune. It’s the first time she had ever picked Dai Kichi (same as great blessing). And mine too since it was my first time to pick an omikuji. 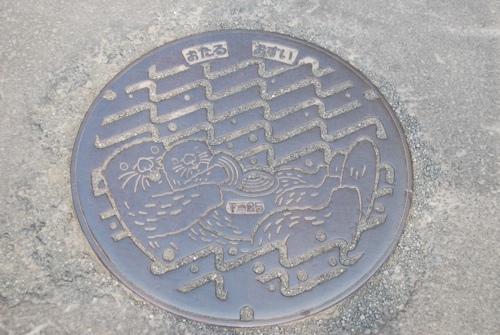 “Mou-icihi-do” (Moe-ee-chee-doe) Hokkaido (above) means “one more time” Hokkaido. 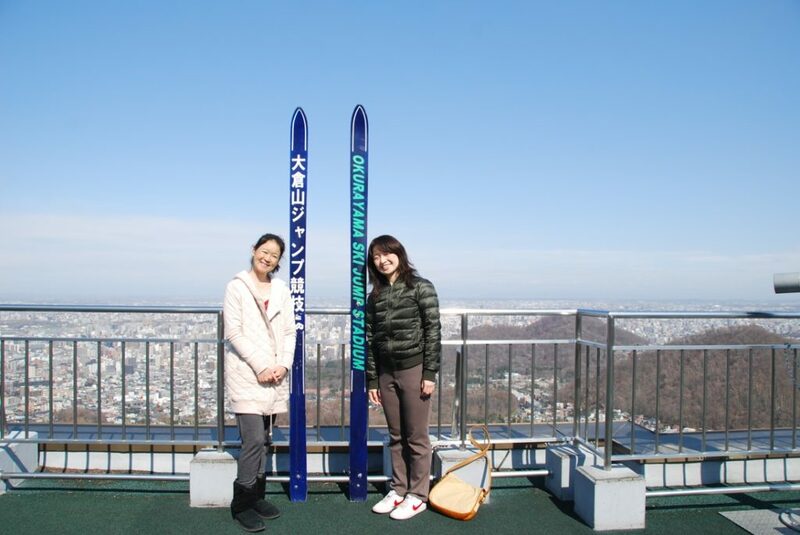 On Thursday, April 26, I flew Jetstar to Sapporo on Japan’s northernmost island of Hokkaido one last time to see my cousin Mayumi and her family. We all couldn’t go because the kids were in school, so I went by myself and John stayed home. 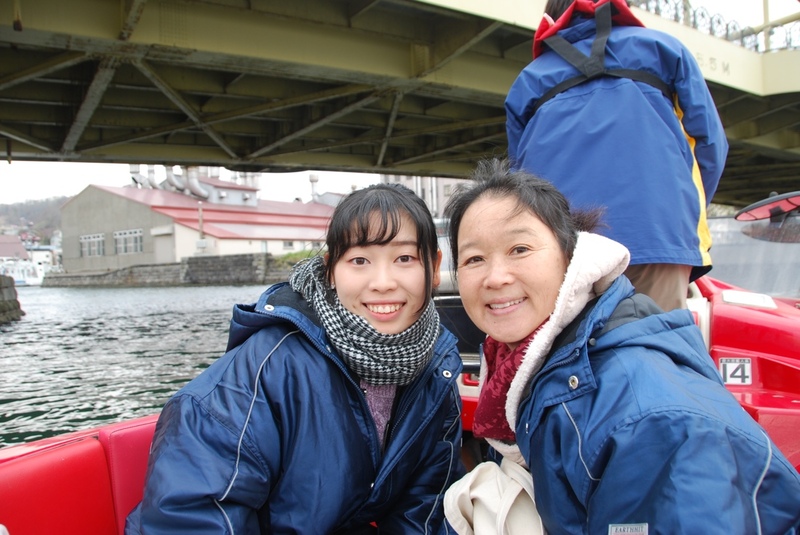 Mayumi was so kind to take off 2 days of work, which in Japan is no small feat. 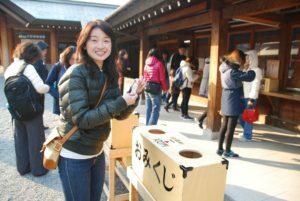 She took me to Hokkaido Shrine, pictured here. There are four deities enshrined here, and I’ve been trying very hard to learn what it means for a deity to be enshrined. As best I can tell is that the God that is embodied in an enlightened or imperial person (or perhaps just the God of the shrine itself) is worshipped at this place. 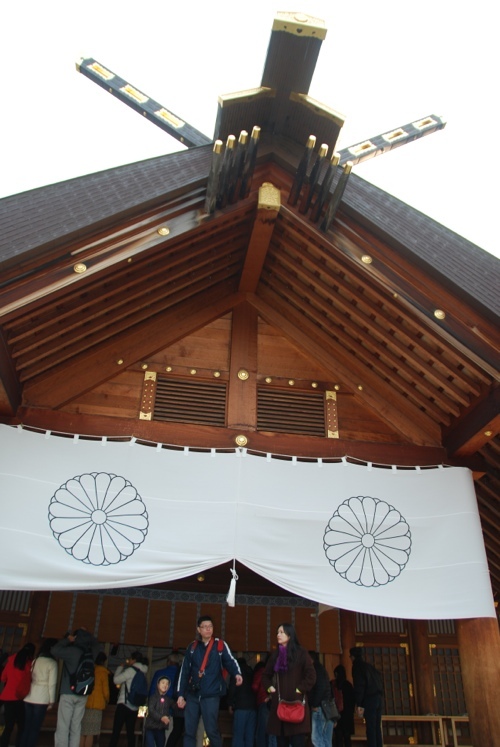 The Emperor Meiji (famous for his chocolate of course) is the most recent to be enshrined at Hokkaido Jingu (Shrine). 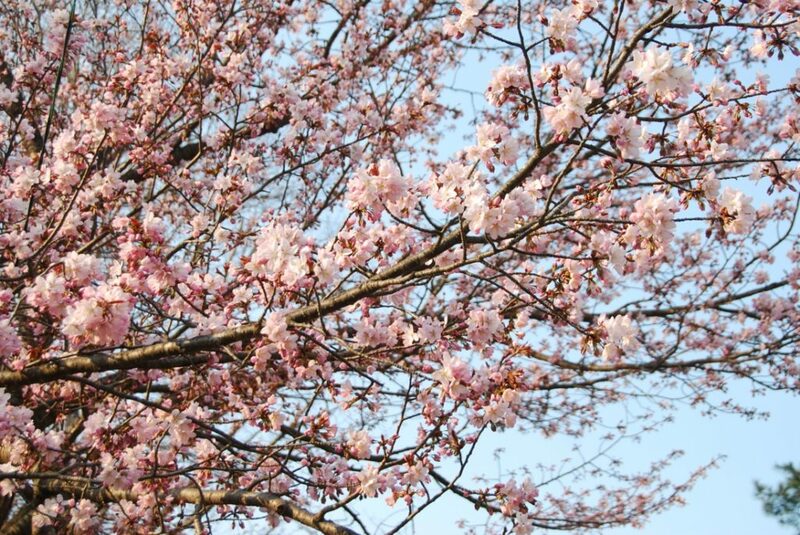 I’m so lucky, it was just the beginning of sakura season in Hokkaido. Even though the sakura blooms are finished at my house, Hokkaido is so much colder that the cherry blossoms come out much later. 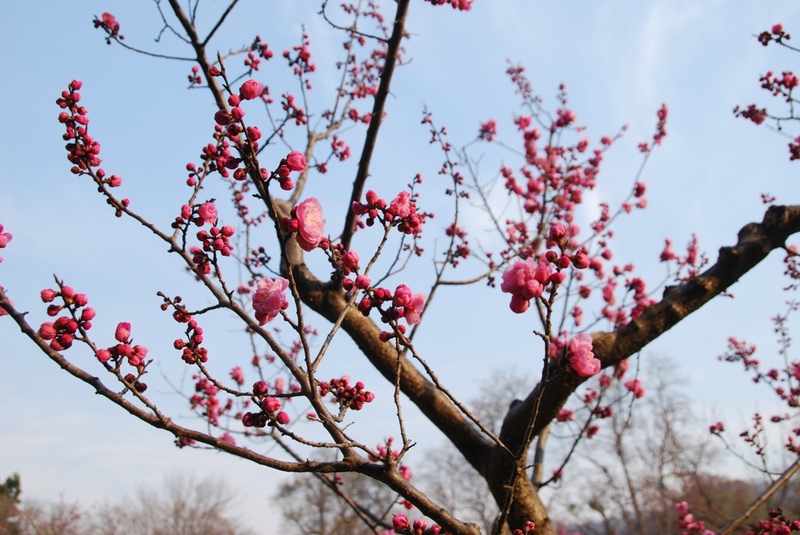 And below, ume (plum) blossoms bloom at the same time as cherry blossoms here. So I got to see both on the grounds of Hokkaido Shrine. 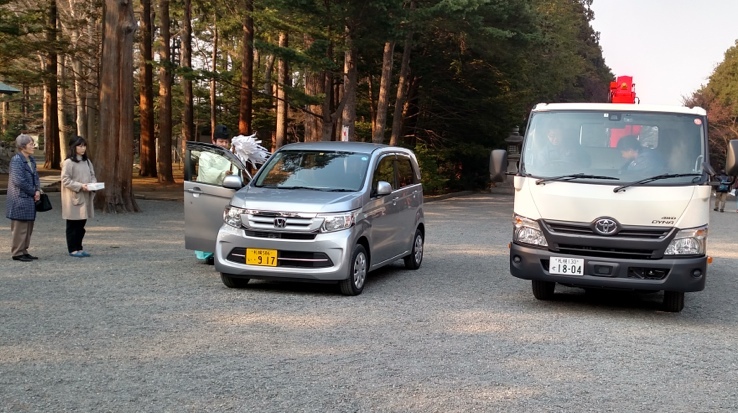 At Hokkaido Shrine a priest was giving blessings to new cars. I was fascinated. He was waving this stick with what looked like white papers all around the car. Two ladies looked on as he did this. Mayumi said people sometimes bring their new cars to temples and shrines to get blessed for protection. She said businesses especially will bring their vehicles and sure enough, one of cars was some kind of service vehicle that looked to be a tow truck of some sort. The men piled into the cab and drove off after. Mayumi was completely unfazed by this but I couldn’t look away! Incredible! Next was Okurayama Ski Jump Stadium. 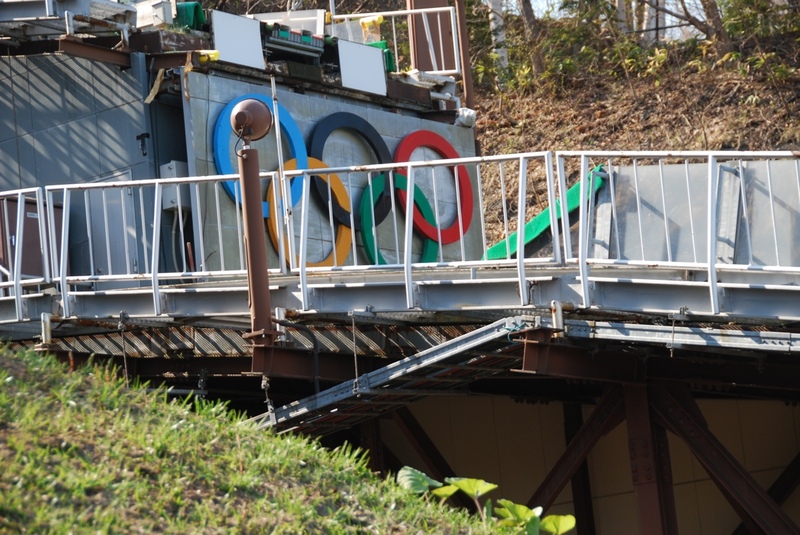 Site of the 1972 Winter Olympics Ski Jump. We rode a chairlift to get up here and it is pretty high. 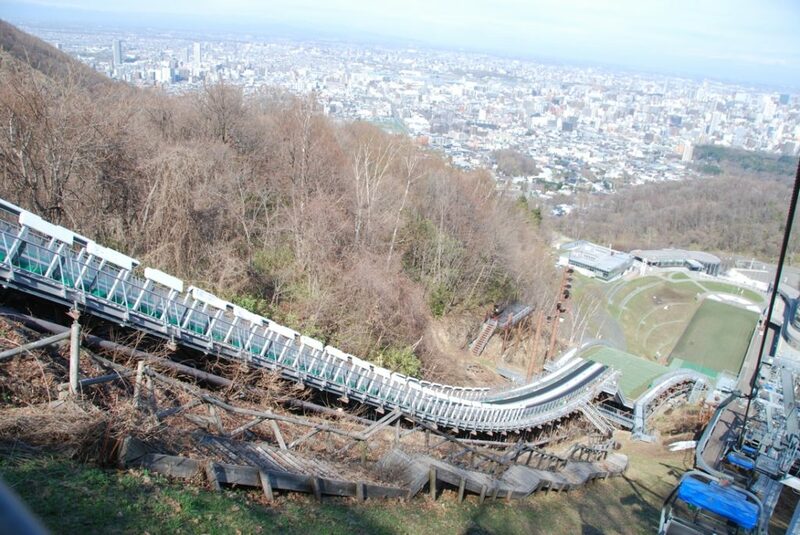 I can’t imagine skiing down that ramp. I’d be snowplowing it the whole way. There’s a nice view up here. Here’s my Airbnb suite. It was four rooms basically. One bedroom with 6 beds (!) and a table and chairs. Another bedroom with one full size bed where I stayed. 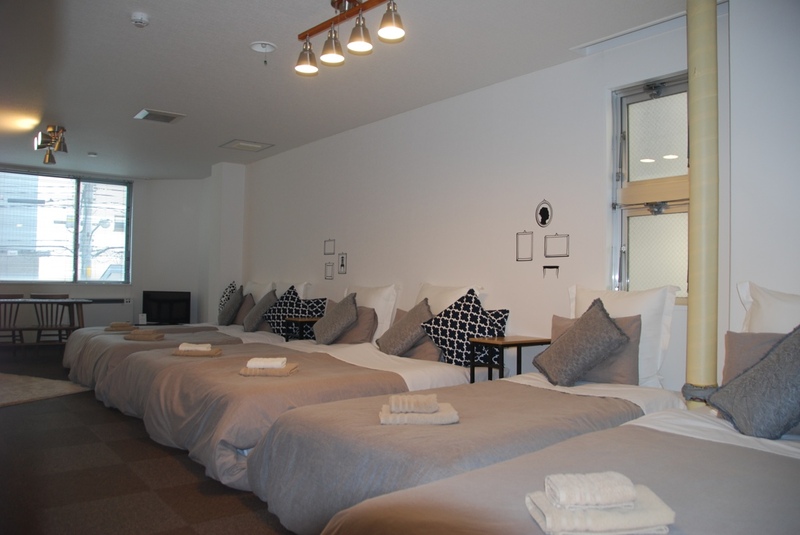 A Japanese room with 4 futons for sleeping on the floor on tatami mats. 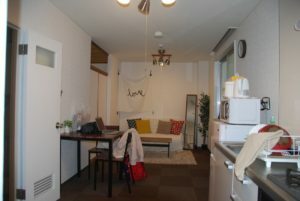 And the main area with a kitchenette, small dining table, couch and mirror. 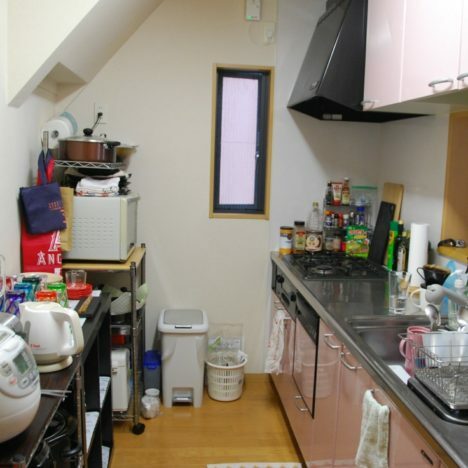 Plus a very large toilet area and a separate shower and washing machine. That’s a lot for one person! I wish my whole family was with me. Of course I didn’t need all that but it was the best place I could find with a pretty cheap rate and a first-rate location just off Odori Park in downtown. No explanation needed. It’s an eight layer soft serve ice cream cone that came with directions on how to eat it. And it was delicious. Matcha, strawberry, lavender, wine, vanilla, chocolate, vanilla & chocolate mix and another mix flavor. 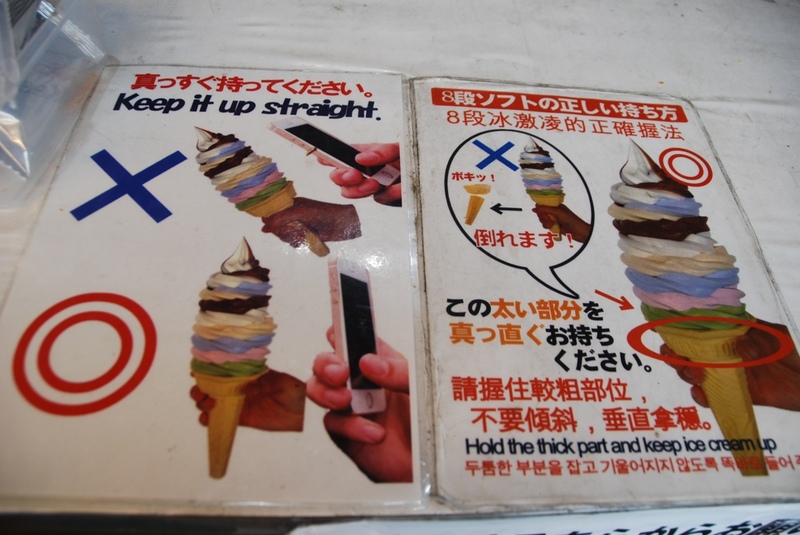 The most important thing: “Keep it up straight.” Especially when taking your Instagram/Facebook/Snapchat photo. 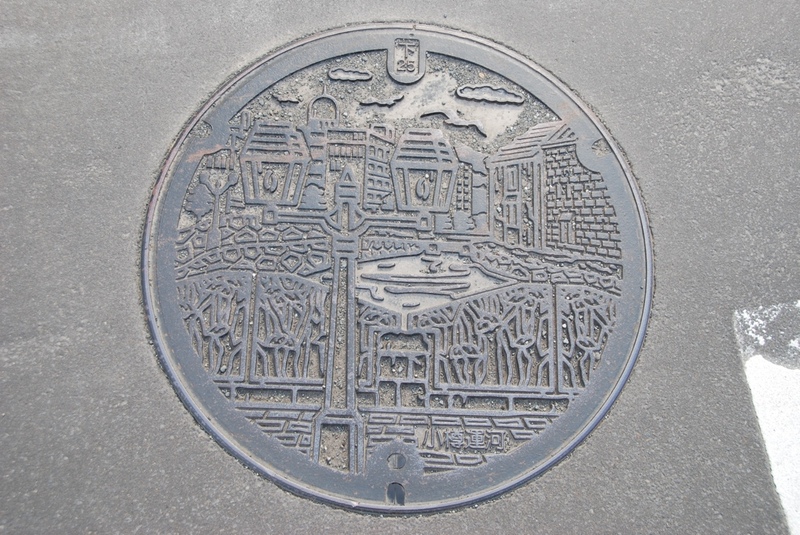 A day trip to the city of Otaru by the water! 8-layer soft serve ice cream. Super fun manhole covers. 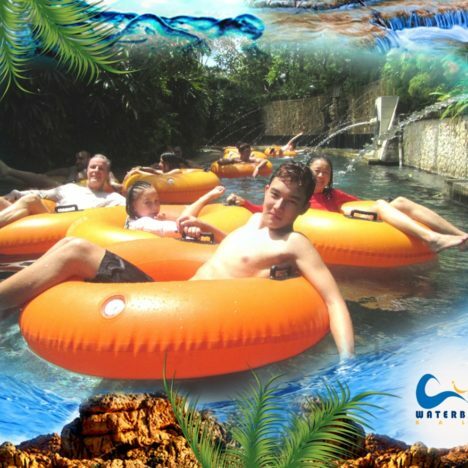 A boat ride with my cousin and her family to a blue grotto in a cave. (It was too rough and we had to turn back. Bummer.) 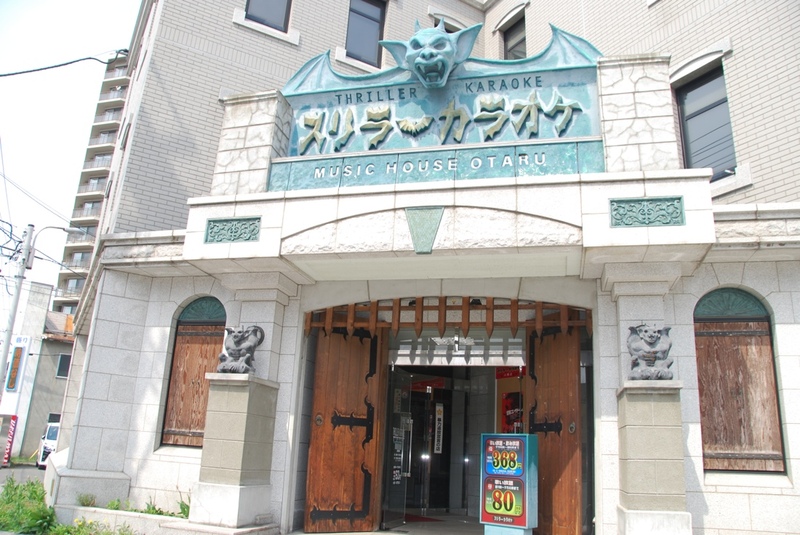 And some really cool buildings, famous Otaru handmade glass and music boxes, jewelry and food. We ate fresh, delicious seafood. We bought a live crab and had it boiled. We ate amazing bowls of sashimi over rice. My favorite tea, genmaicha (Japanese brown rice green tea), warmed us up after our wet and windy boat ride. And finally, at the end of the day, a stop at Kamaei, a very famous store and factory for kamaboko, which is Japanese fish cake. 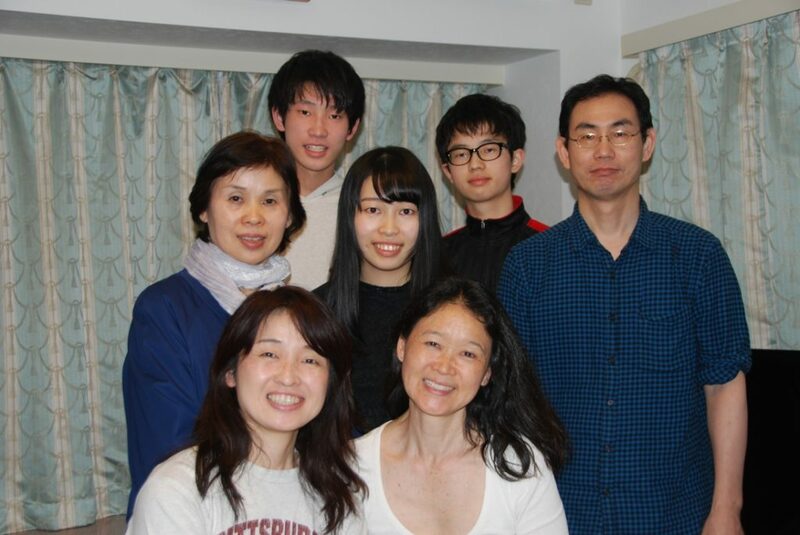 We couldn’t have come to Japan without this family helping us. Thank you so much! 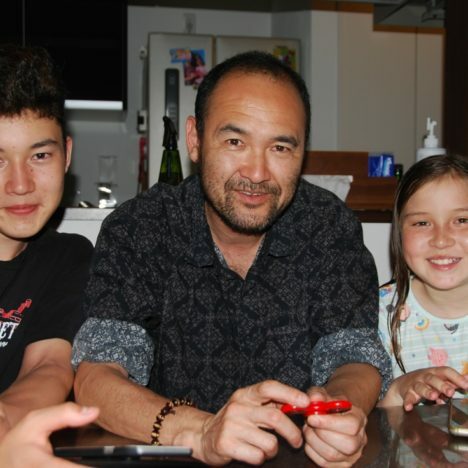 Our two years in Japan were the best and a special bonus is my kids got to know these kids here. Such a thing is priceless. Arigatou! 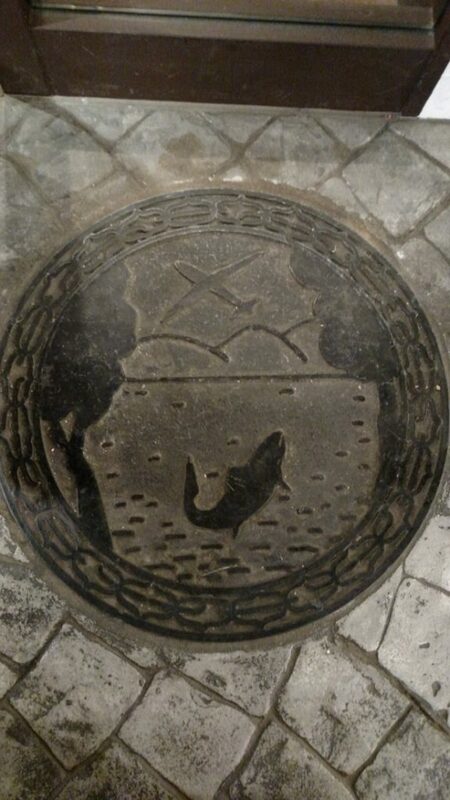 I saw this manhole cover on my way home. It’s actually inside New Chitose Airport in Sapporo. It was outside a soup curry restaurant where we were waiting for a table. I love it!